Walking Dead should be everyone’s favorite TV series ! 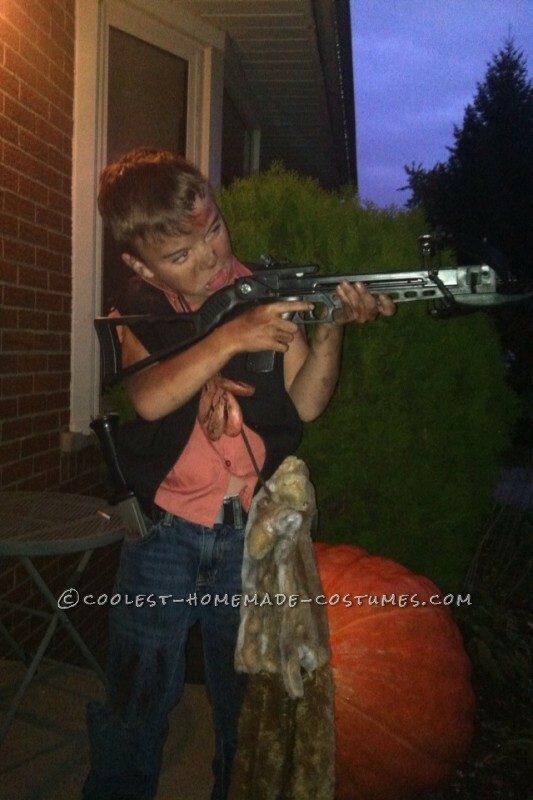 And of course as well as everyone’s favorite character should be Daryl Dixon! 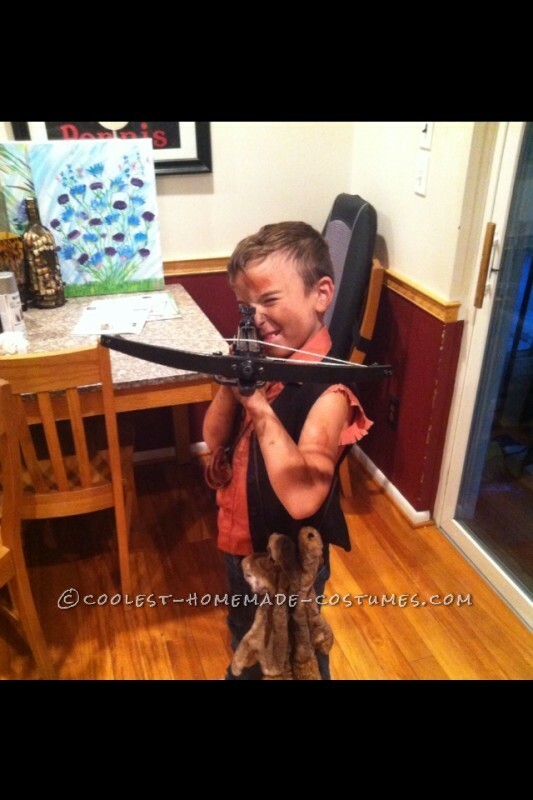 Once my son said he wanted to be Daryl I immediately got to work. I decided to combine his look through all the seasons so he could be recognized. I first went to the Salvation Army and bought a burnt orange button up dress shirt (Daryl wears a red one I believe) and cut the sleeves off of it and frayed the ends (all with scissors), then I tried to find a leather vest but they were so expensive so I bought a regular black dress vest (like you’d wear with a shirt and tie and you couldn’t tell the difference ! Then I grabbed a pair of old jeans. Ripped holes in the knees and I had the clothing part complete! 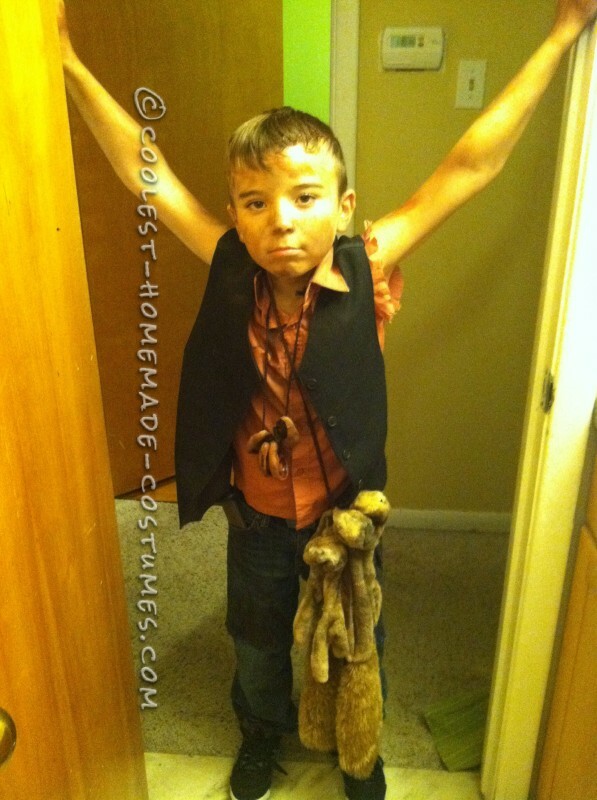 Then on to the accessories… Daryl had a necklace full of ears from zombies. I was going to make them but couldn’t find the right materials so I actually purchased the ear necklace from a spirit Halloween store. Daryl also had a rope with squirrels he had killed. So I grabbed some rope and went to Petco and bought a couple “Skinneez” brand non stuffed squirrel dog toys. Stabbed a hole through their heads and wove the rope through it. On to the most important accessory of Daryl’s character. The crossbow. This being the most important part I did go a little out there and spend 50 dollars on a crossbow from NCstsr BUT let me tell you it was worth it! (The crossbow actually works amazing). Anyways after the props it was on to creating the zombie apocalypse look. I bought something called “zombie dirt” from Halloween city. It came with brown and black (just take a makeup brush. Mix them and brush all over). I covered his face, arms, knees, neck, ears etc. in dirt (Daryl was always pretty dirty) then came the blood. Random splatters on the arms and head but mainly the hands (covered them in blood) then I also covered the toy squirrels in dirt in blood to give them a realistic look. Last but not least Daryl’s knife. I bought a cheap one from Walmart. Also covered it in dirt and blood and he was all set. It was a huge hit! Mainly by teenagers and adults! The adults were completely impressed and jealous of his costume. My son was also very proud. Altogether I probably spent 70 dollars on this costume. The crossbow being 50 dollars of it. You can also get cheaper crossbows and edit the props. 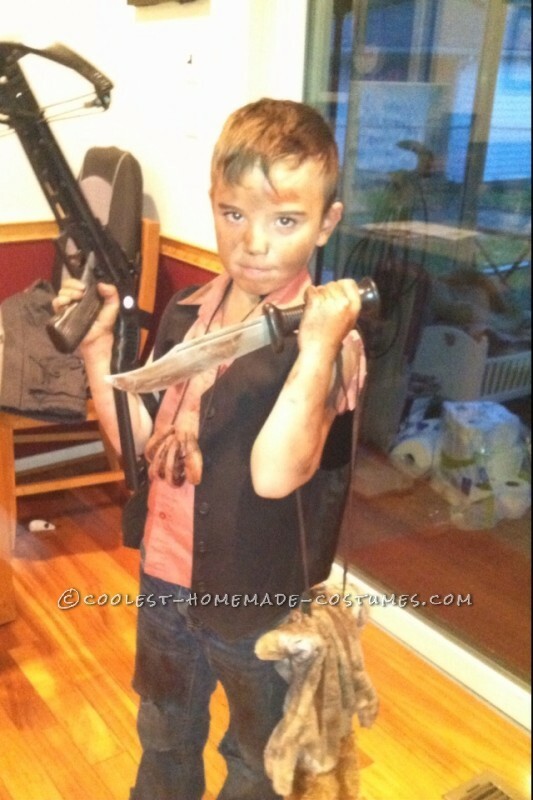 I would suggest maybe getting a similar doll as Sophia’s that Daryl hung from his belt while searching for her. Or in more recent episodes he has a quiver on his back that holds the arrows. Another good prop! 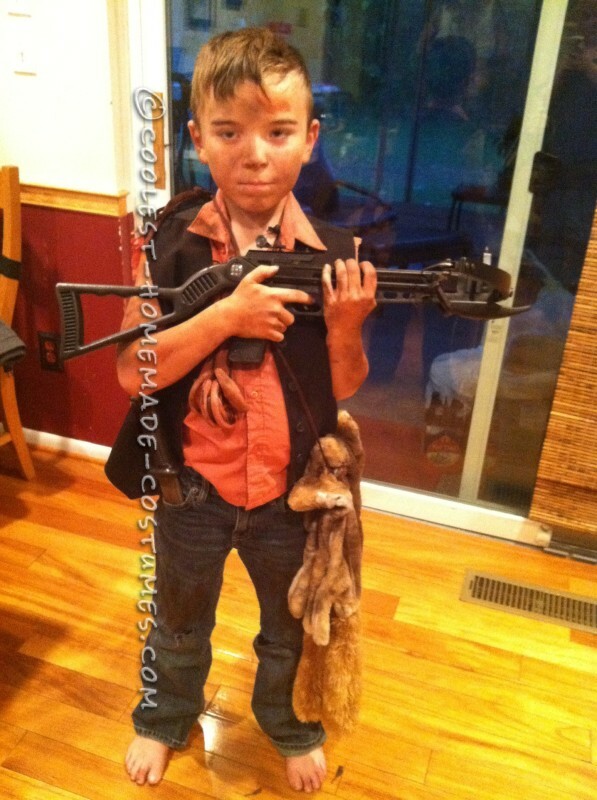 Hope this inspires more great Walking Dead costumes! Especially Daryl ones! (haven’t seen to many out there) and you enjoy making your own!